WASHINGTON - A U.S. Navy destroyer has rescued an Iranian fishing boat that had been commandeered by suspected pirates just days after Tehran warned the U.S. to keep its warships out of the Persian Gulf. American forces flying off the guided-missile destroyer USS Kidd responded to a distress call from the Iranian vessel, the Al Molai, which had been held captive for more than 40 days, the U.S. Navy said Friday. The Kidd was sailing in the Arabian Sea, after leaving the Persian Gulf, when it came to the sailors' aid. 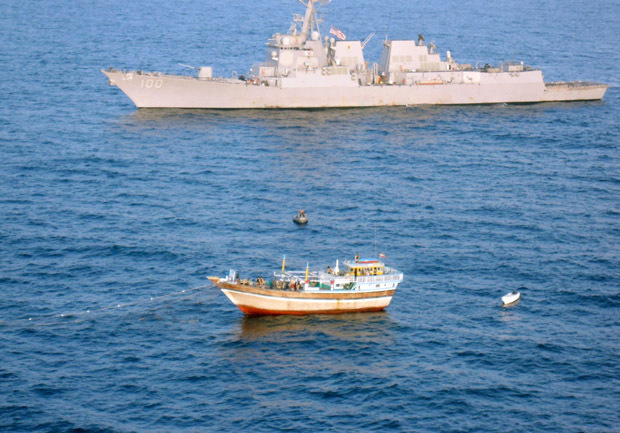 A U.S. Navy team boarded the ship Thursday and detained 15 suspected Somali pirates. They had been holding the 13-member Iranian crew hostage and were using the boat as a "mother ship" for pirating operations in the Persian Gulf. U.S. Defense Secretary Leon Panetta commented on the rescue in an interview scheduled to air Sunday on CBS' "Face the Nation." "It's what we do. And it's what we do in that part of the world. We get a distress call, as we did in this case, even though it came from an Iranian ship. When the pirates went after them, we respond to those calls," Panetta said. "We did what we have to do in that situation. I think it just sends an important message to the world that the United States is going to abide by international rules and international order, and that's exactly what we did here." In the same interview, Gen. Martin Dempsey, chairman of the Joint Chiefs of Staff, said the suspected pirates surrendered without incident. "I think in the face of the overwhelming combat power that was presented the pirates made the right decision," he said. Amid escalating tensions with Tehran, the Obama administration reveled in delivering the news. "This is an incredible story. This is a great story," State Department spokeswoman Victoria Nuland said, explaining that the very same American ships the Islamic republic protested for recently traveling through the Strait of Hormuz were responsible for the Iranian vessel's recovery. "They were obviously very grateful to be rescued from these pirates," Nuland said. The episode occurred after a week of hostile rhetoric from Iranian leaders, including a statement by Iran's Army chief that American vessels are no longer welcome in the Gulf. Iran also warned it could block the Strait of Hormuz, the strategic waterway that carries to market much of the oil pumped in the Middle East. The Iranian threats, which were brushed aside by the Obama administration, were in response to strong economic sanctions against Iran over its disputed nuclear enrichment program. Last week, President Obama signed into law new sanctions targeting Iran's Central Bank and its ability to sell petroleum abroad. According to the Navy, the Kidd was part of the USS John C. Stennis Carrier Strike Group, which had recently left the Persian Gulf through the Strait and into the northern Arabian Sea. A Navy search and seizure team was taken by helicopter from the Kidd to the Al Molai. "The Al Molai had been taken over by pirates for roughly the last 40-45 days," said Josh Schminsky, a Navy Criminal Investigative Service agent aboard the Kidd. "They were held hostage, with limited rations, and we believe were forced against their will to assist the pirates with other piracy operations." Schminsky said the Iranian boat's captain thanked the U.S. for assistance. "He was afraid that without our help, they could have been there for months," Schminsky said in a prepared release. The U.S. team gave the crew food, water and medical care. Nuland said the crew then returned the Iranians to their fishing vessels "and they went on their way." The captured pirates remain on the Stennis while the U.S. considers options for prosecution and consults with other nations that have joined forces against piracy. "Sadly, this is not a new thing," she told reporters, citing more than 1,000 pirates picked up at sea who are under prosecution in some 20 countries. "So this is always a question of where to send them and who will do the prosecution." Asked if the rescue mission could provide a chance for a thaw in relations with Iran, Nuland declined to comment. She said the Navy had made a "humanitarian gesture" to take the Iranians onboard, feed them and ensure they were in good health before setting them off. She said the U.S. and Iranian governments have had no direct contact over the incident.